deej: My first thoughts: The trailer is quite short, but does a good job in the short time it has with connecting Tolkien’s experiences in WWI and the creation of his Middle-earth stories. The image of the ‘fire dragon’ toward the end was especially powerful! 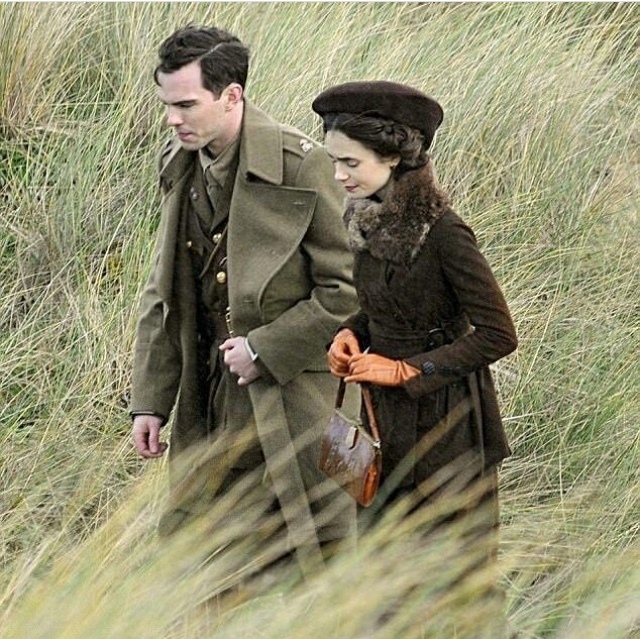 It looks like a beautiful film – I just hope that the actors and script do the Professor & Edith justice. grammaboodawg: The imagination that’s threaded through this trailer made my jaw drop more than once. The beginning reminds me of Bilbo lighting the candle at the beginning of Jackson’s “The Hobbit: An Unexpected Journey”. A young Tolkien lights a candle in a revolving lantern that throws images of eagles and horse & riders on the wall. 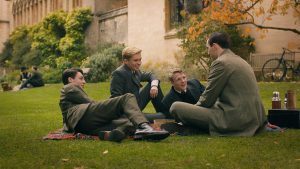 I love how the film is peppered with so many familiar images that Tolkien experienced in his youth, in maturing with friends, when finding love, and finally when thrown into war. It’s during the scenes of war that the imagery becomes hard and real. The juxtapositions are striking. The four friends laughing and moving through the crowd changes to the same line of faces standing side-by-side in their war-gear during battle. Tolkien lying in the sunshine watching Edith (Tinúviel) dancing among the trees changes to him lying in the mud and ash of combat. Seeing the fiery face that appears in an explosion among the soldiers becoming like a Balrog roaring was startling. And more chilling is in the battlefield where there are smoky/shadowy shapes slowly forming along either side of a massive fiery shape wrapped in smoke growing before the man (Tolkien) who is draped in a blanket like a cloak standing firmly in the devastation. These hints of what was forming in Tolkien’s imagination give me goosebumps. I don’t know what I was expecting when I first heard of this film. I think more of a standard biography seen in so many life stories. This film is alive with images of Middle-earth that makes it feel more like Tolkien is discovering the world himself. That he was more of a vessel to bring it to life for the rest of us. 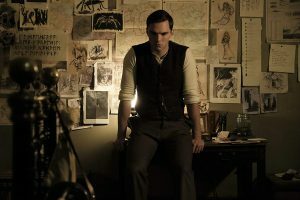 Tookish: A biopic about The Professor- I’m almost as excited about seeing this movie as I was when I wrote a term paper on Tolkien’s life in 7th grade! Almost. The trailer is magnificent and cleverly markets the film as if IT is one of the epic stories that Tolkien penned over so many decades. The scenes of young John and his friends remind me more of Pevensies than hobbits (maybe it’s the wardrobe and all the running around… at first I thought it was supposed to be The Inklings- where are they? ), and all of the principals seem a bit outrageously gorgeous, but these elements are not bothersome to me. It’s pure fun to see yet another artistic interpretation of characters and such from the Middle Earth canon- how much will we see of that? Hopefully, not overmuch: it’s about Tolkien’s life, not that of his creations. I absolutely love the imagery of the intertwined trees. Is it John and Edith? Good and evil? Beren and Lúthien? Telpirion and Laurelin? We wonders, Precious, yesss we do! 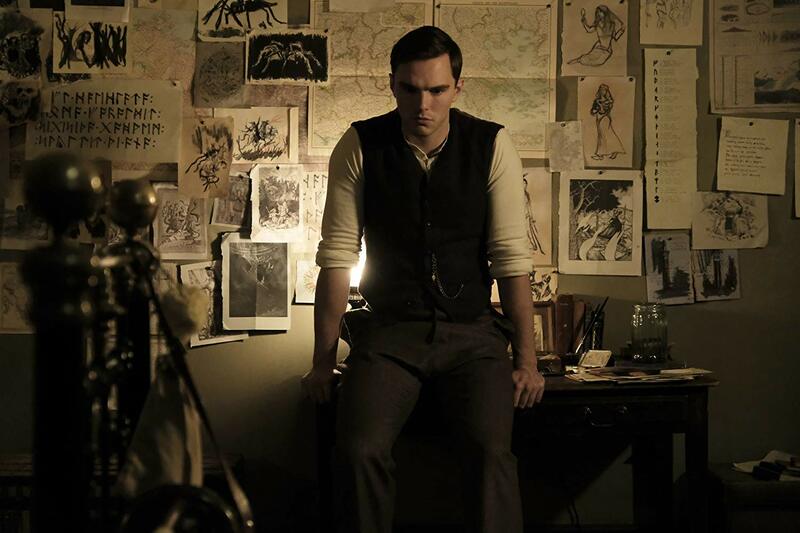 What I missed was any kind of intellectual stimulus or even a nod to Tolkien’s accomplishments in academia, the tragedies that shaped him as a youth, his witness of the onslaught of technology and modernism on the natural world, and some other weighty elements of his life’s story. I trust these events and components will present heavily in the film, while at the same time fearing that Tolkien may be glorified and idealized, losing essential elements of his humanity through this telling. My thanks to all involved in this production! Garfeimao: There is a definite vibe of the Epic about the trailer, while also keeping the personal intact. I love the fact that they use a narration over the teaser, a storyteller, since that is the very essence of Tolkien the man. We see a young Tolkien with his friends and with his future wife, the intimacy and personal story that created a part of his life story. But then we do see images from the Great War, both the reality of what he experienced, as well as the more fantastical imagery that anyone in battle for the first time might imagine in order to cope with the atrocities of war. Just how much of the fantastical is in this movie, and how much of a real life lived, I guess we’ll just have to wait and see. I do love the clever moments where real life experiences are suggested to have inspired elements of Middle–earth; that balrog face in the explosion is fabulous. The title graphic (both the way it flies in and the font) are reminiscent of PJ’s Lord of the Rings movies. The trailer does make me excited and I am eager to see this movie. BUT the cynic in me wonders if they are trying TOO hard to make it look like the Lord of the Rings movies; and to make The Professor some romantic, heroic, dashing figure which he perhaps wasn’t. I don’t think this is going to be a ‘biopic’ really; I don’t see it looking closely at who JRR Tolkien really was. It seems it will be a very romanticized tale, making his life and his love for Edith play out like one of his own stories. Nothing wrong with that; I’m sure it will be very enjoyable. But I think there’s also room for a film which tells a more documentary style biography. At one time there were TWO Tolkien biopics in the works; perhaps we may yet get that other telling?? Justin: Are we supposed to feel… this way… about JRR Tolkien? This teaser is action packed with a good looking John & Edith which is far removed from the grandfatherly Inkling we all love. But to experience what Tolkien saw that inspired the heroic and tragic tales he would go on to write is a true blessing. This film is perfectly timed – the right subject, with the right actors, from the right director, released by the right studio. Hopefully it delivers both in May and at Awards time. I think we are all ready to celebrate the professor himself.